This tabletop easel and book stand is the perfect studio, office or home addition for use with books, tablets, canvas and panels. 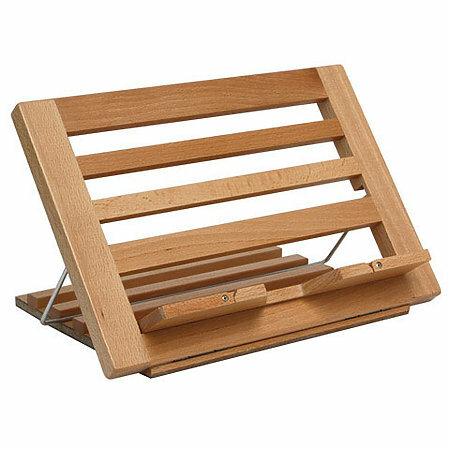 Made of hand-sanded beechwood, it features a fold-out 2" deep tray with two flip-up page holders to securely mark your place and a beveled center cut-out allowing tablets to charge while on the stand. The easel incline adjusts to three positions and will accommodate a canvas or panel up to 14" wide. Ships fully assembled and folds flat for easy storage or transport.